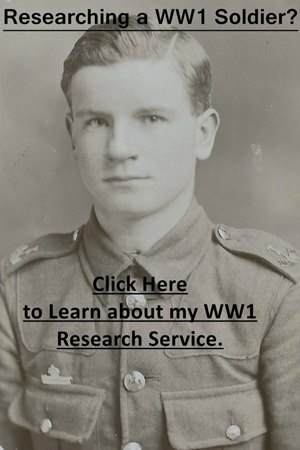 I also offer a WW1 Soldier Research Service. Lineage: Formed at Karachi on 1 July 1917 as the 49th Bengal Infantry but later redesignated as the 49th Bengalis. The Regiment was disbanded on 30 August 1920. 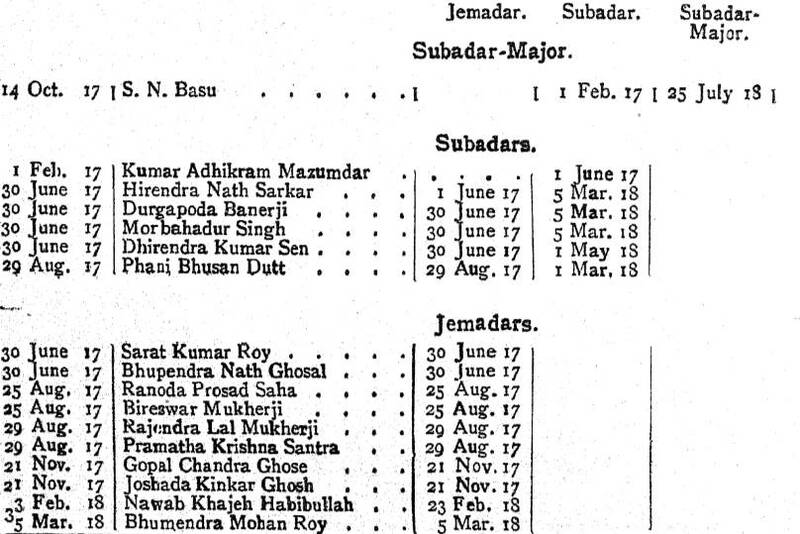 Class Composition of Battalion in 1919: Bengalis. The 49th Bengalis was one of the most unusual Indian units to be formed during the First World War and the Regiment makes an excellent case study of the martial races theory. The Regiment was borne by the desire of Bengalis to contribute to the war effort and a Double Company of Bengalis was recruited in 1916. These early recruits formed the basis of the Regiment which was formed at Karachi on 1 July 1917. The extract below was taken from the July 1918 Indian Army List and recorded the Indian officers serving with the Regiment. The discipline, tone and appearance of all ranks has improved of late, but is still far from satisfactory. The men can turn out well but do not do so as they are by nature of dirty, filthy habits. Morally and physically they are without much stamina and generally lack all sense of responsibility, decency or shame. Reliable Bengali Indian Officers and Non-Commissioned Officers seem quite unprocurable, and without these satisfactory results can hardly be expected. I saw this depot on 21st January 1919. In spite of all efforts made to turn them into soldiers the material is physically so unpromising and mentally so unsuited to become soldiers that I do not think it could ever be brought to the point of having any military value as fighting material. The 49th Bengalis arrived at Basra, Mesopotamia (Iraq) in July and August 1917. The Regiment would have an uneventful war serving on the Lines of Communication for nearly three years. For the exact location of the Regiment and its activities, there are two war diaries which can be downloaded. The 49th Bengalis returned to India in 1920 and was disbanded on 30 August 1920. There are two war diaries for the 49th Bengalis and both have been digitized by the National Archives. To download the war diaries for a small fee click on the blue links below which will take you to the National Archives’ website. I have transcribed some extracts at the bottom of the page. Notes: The first half of the war diary is typed and there are frequent mentions of British and Indian officers and other ranks (with regimental numbers). The 49th Bengalis were serving on the lines of communication so there is very little of interest in the diary. Many daily entries consist of nothing more than notations of deaths or invaliding due to disease. Notes: Like most units serving on the lines of communication, very little happened. Between May 1918 and March 1919, the war diary is typed. British and Indian officers are mentioned throughout and British Non-commissioned officers who are serving with the 49th Bengalis are frequently mentioned as they come and go. Report of shooting affray in which three Indian officers were attacked and shot. IOR/L/MIL/7/7279. Enlistment of Burmese and Question of Bengali Battalion: IOR/L/MIL/7/17768. Contains a detailed report by Lieutenant-Colonel A. L. Barrett on the poor state of the Regiment and also a regimental history. A very interesting file if you are researching the 49th Bengalis or looking into the martial races theory. 27 August 1917 – Basra – The Battalion commenced to draw the new ration sanctioned temporally for the Regiment and consisting of:- Atta 1lb., Rice 1/2lb., Fresh Meat 6oz., Dhal 4oz., Ghi 2 6/7oz., Gur 2oz,. Fresh Vegetables 1lb., Fresh Fruit 4oz., Tamarind 2oz., Salt 1/2oz., Kraba 1lb., Lime Juice 1/2fl.oz., Milk Tinned 5oz., Tea 1/3oz., Firewood 1lb. 27 December 1917 – Baghdad – One Indian Other Rank died of Cerebro-Spinal Meningitis in the Isolation Hospital, Baghdad. 09 June 1918 – Kut – The following Indian Officer having died from wounds received from a Revolver, is struck off the strength accordingly:- Subedar A.K.Mitra. No 605 Sepoy (Temporary Naik) S. Choudhury, B Company. 10 July 1918 – Tanooma – The following Indian officer has been authorised by His Excellency the Commander-in-Chief to resign his commission, from 19 December 1918:- Jemadar K. Habibollah (Nawab of Dacca).